Arrive at Trivandrum. Check into the hotel followed by a sightseeing tour of Trivandrum. Overnight stay at the hotel. A full day onboard journey through the backwaters explores the scenic beauty of the God's own country - Kerala. An optional excursion to Palluruvi, which means - the River of Milk. One of the popular water falls in south India is situated near Kollam. The scenic beauty complete with hills, valleys and cascades, covered with dense tropical forest is breath taking. Overnight stay at the hotel. A backwater cruise from Quilon to Alleppey. 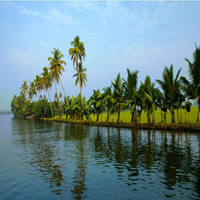 Enjoy the scenic beauty of Kerala during your full day onboard journey through the backwaters. After arriving at Alleppey and board a backwater resort. Overnight stay at the hotel. 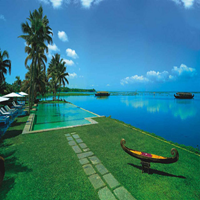 Spend a day on the backwater resort while enjoying the lush green surroundings. Kumarakom is a unique backwater destination on the banks of Vembanad Lake. Kumarakom bird sanctuary is home to the migratory birds ideal for bird watching. It is also famous for the houseboat cruises. Overnight stay at the hotel. Drive to Kochi/Cochin, the natural harbour in the city. Sightseeing tour of Kochi can be done on boat in which you visit Jewish Synagogue, Dutch Palace, St Francis Church, Chinese fishing nets and Bolgatty Palace. Overnight stay at the hotel. Depart to the onward destination or way back home from Cochin airport.